Temperament: The Miniature Schnauzer is a very spirited and alert dog. The dog is obedient and learns commands well. The Miniature Schnauzer is a friendly and intelligent dog who loves to please. The Miniature Schnauzer should not demonstrate any aggressive or timid behavior. Appearance: The Miniature Schnauzer is an active, robust, sturdily built dog. Miniature Schnauzers should be active and alert. Size: The Minatare Schnauzer should be between 12 to 14 inches tall. Head: The head of a Miniature Schnauzer should be rectangular in shape, narrowing slightly as it approaches the eyes and toward the tip of the nose. The forehead of a Miniature Schnauzer should not be wrinkled. The top of their head should be flat and fairly long. Eyes: The Miniature Schnauzer has small, oval, dark brown, deep-set eyes. Ears: The ears of a Miniature Schnauzer can be either cropped or uncropped. When cropped the ears should be symmetrical in shape, with the width and length approximately equal and the tips pointed. The ears should be set high on the head. When uncropped, the ears should be small and V-shaped, with a fold close to the head. Muzzle: The muzzle of a Miniature Schnauzer should be proportionate to their head containing thick whiskers that accentuate its rectangular shape. The Miniature Schnauzer has a scissors bite. Neck: The Miniature Schnauzer should have a strong, well arched neck that blends nicely into the shoulders. The skin on the throat should be tight fitting. Body: Miniature Schnauzers should appear almost square in proportion. The length of their body should be approximately equal to their height. The underbody of a Miniature Schnauzer should not have a tucked up appearance below the ribs. The back should appear straight with a slight decline from the shoulders toward the base of the tail. Forequarters: The front legs of the Miniature Schnauzer should appear straight and parallel when viewed from any angle. The elbows should be close together. The ribs should spread gradually from the first rib, allowing ample space for the elbows to move close to the body. The shoulders should appear muscular and clean. The tips of the shoulder blades are close together and slope forward and downward permitting maximum forward extension of the front legs without effort. Hindquarters: The Miniature Schnauzer's hindquarters are muscular with slanting thighs. The stifles should be should be sufficiently bent so that when standing the hocks extend beyond the tail. The hindquarters should not appear too muscular or be higher than the shoulders. The rear pasterns should be short and appear perpendicular when viewed from the rear. Gait: The elbows of the forelegs should be close to the body and have a straight forward motion. The rear legs are straight and should move in parallel with the front legs. Feet: A Miniature Schnauzer's feet should be round and short containing thick, black pads on the bottom. The Miniature Schnauzer's toes should be compact and arched. Tail: The Miniature Schnauzer's tail should be set high on their body and carried erect. The tail should be docked and left just long enough to be visible over the back. Color: The recognized colors of a Miniature Schnauzer are salt and pepper, black and silver and solid black. All color combinations should have a uniform skin pigmentation free from any white or pink skin patches. The Salt and Pepper color results from the combination of black and white hairs. All shades of Salt and Pepper are acceptable including dark mixtures with tan shadings. The eyebrows, whiskers, cheeks, under throat, inside ears, across chest, under tail, leg furnishings, and inside hind legs should be light gray or silvery white. The Black and Silver variety should have the same pattern as the Salt and Pepper variety with the entire salt and pepper section being solid black. There should not be fading or brown tinge in the stripped portion and the underbody should be dark. The Black variety consists of a rich, solid black, glossy topcoat with softer shade of black in the undercoat. The scissored and clipped areas may appear a lighter shade of black. The only other color permitted is a small white spot on the chest. Coat: The Miniature Schnauzer has a double coat. The outer coat is hard and wiry with a close undercoat. The coat on the head, neck, ears, chest, tail, and body should be plucked. Characteristics: The Miniature Schnauzer is a delightful and attractive dog. Miniature Schnauzers make great watch dogs. All three variations of the Schnauzer were developed in Wurttemburg and Bavaria in Germany. The original size of the Schnauzer was the Standard Schnauzer which dates back as far as the 15th century. It was from the Standard Schnauzer that all of the other variations were created. It is believed that the original Schnauzer was created by crossing the German Pudel, the German variation of the Poodle, with the Wirehaired Pinscher and the German Wolfspitz. Schnauzers were originally part of the Terrier Group from 1899 to 1945 because of the similarities between the two. The Schnauzer was transferred to the Working Group after it was discovered that the Schnauzer had originally served as cattle tenders and guard dogs. 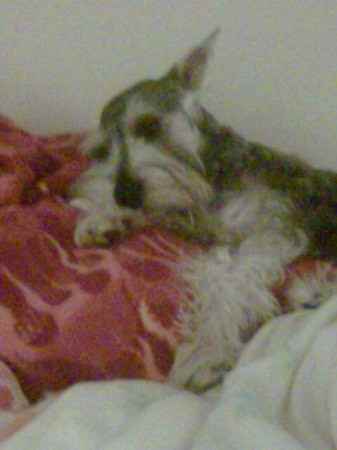 The Miniature Schnauzer was developed by crossing the Affenpincher with the smallest of the Standard Schnauzers. The first Miniature Schnauzer dates back to the late 19 century. The Miniature Schnauzer was first recognized as its own breed in Germany in 1899. The first Miniature Schnauzer came to America in 1925.